The inspirational blogs are more and more multiplying and spreading nowadays. Humble blogs, created with only one aim : make people travel and dream : diverse images (design, architecture,…), pics, documentaries, music videos..Elements coming from different backgrounds, gathered in one and unique place for a paradoxically coherent result. The concept is simple : here, the text gets discrete, or even absent, to value the visual content and let it express itself. The inspiration blog therefore is a space which can be be appropriated by anyone and interpret personally the emphasized elements. Couvre x Chef has decided to promote these blogs. 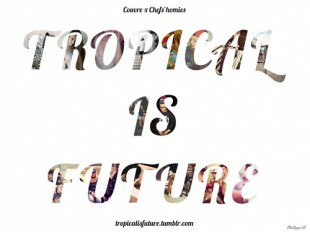 The first blog of the inspiration series is TROPICAL IS FUTURE, a blog founded by our homie Harold Café Crème. Regularly updated and incredibly enchanting, the homeboy knows how to make you travel. EDIT : our favorite blog is now hosted at Croque-Mouton.